Looking at the world from above, as geomaticians are wont to do. 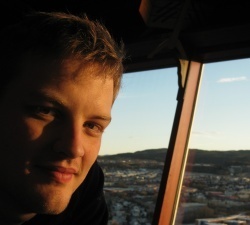 My name is Robert Nordan and I’m formerly a student at the Norwegian University of Science and Technology, doing Engineering Science & ICT with a specialisation in geomatics. Academically I’m interested in the powerful combination of geomatics and IT and the way geographical information is entering more and more parts of people’s everyday use of the internet. Currently, I am employed as software engineer at Norkart AS, Norway’s leading company in the field of Geographic Information Systems. Here I potter about with a number of different things, the two most important of which have been our app Kommunekart on Android and our new Leaflet-based API for online maps. I’m also very enthusiastic about open source software and free licensing, and will rabidly preach the superiority of Linux and F/OSS over anything else to anyone who is bothered listening. And yet, these very lines are written on a Windows machine which I have because I recognize the fact that most commercial software is made for it. My head may be in the skies, but my feet are on the ground. I’ve written several add-ins and contributed features to Tomboy Notes, a brilliant program to which I am addicted. Also, I’ve recently stumbled myself on to the maintainer team of Pinta, a brilliant multiplatform Paint.Net clone. Just enough complexity without becoming hard to use. (Notice how all apps I involve myself in are brilliant.) I look forward to helping the Pinta community grow and thrive! Personally, I enjoy mucking about with all sorts of computers and gadgets, playing computer games (this is what got me into computers to begin with), and running around in the woods being an outdoorsman (because we all need balance in our lives). I have a girlfriend fiancé whom I love very much, I will happily walk up to and attempt to pet any dog I see for the first time, and I’m generally quite pleased to be living in a country as good as Norway. This website is based on WordPress for easy and automatic publishing. I make it a point of pride to make sure that all the CSS and HTML validates with the W3C (pages should be readable even with all style and formatting removed), and that all content i use from other sources has the license in order. However, I reserve all rights to my own content because it’s personal. If I have something I wish to spread freely, such as the CalcAddin, it will have the appropiate license notice. Also, I can never decide whether to write licence or license. Good thing free software is about choice. I came across your profile through a Google search and see that you have put up many useful topics on Github. Considering your expertise in Maps, I feel you’d be one of the best persons who could provide an honest, unbiased review of the book. I’m confident that your thoughts about this book will prove to be an interesting read for your audience/subscribers as well. can you develop a graphics drawing software for me?